American Michael Kim cruised to his first PGA Tour victory and a trip to the British Open with a runaway win at the John Deere Classic on Sunday. 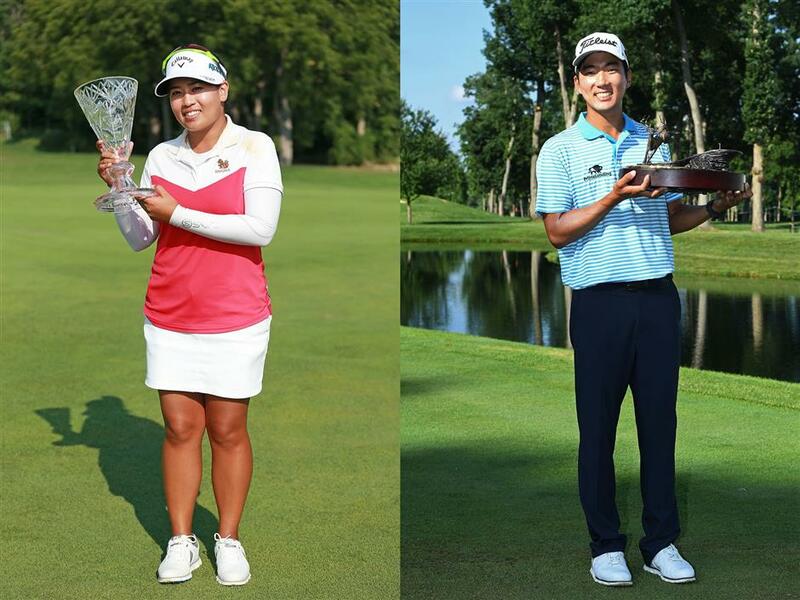 Right: Thidapa Suwannapura of Thailand holds the trophy after her Marathon Classic victory at Highland Meadows Golf Club in Sylvania, Ohio, yesterday.Left: American Michael Kim poses with the trophy after winning the John Deere Classic at TPC Deere Run in Silvis, Illinois, on Sunday. Kim birdied his first three holes and was never challenged as he shot 5-under-par 66 to win by eight strokes at TPC Deere Run in Silvis, Illinois, a day after his 25th birthday. The trip to the British Open, which begins on Thursday at Carnoustie in Scotland, will be Kim’s second career major. He tied for 17th and was the low amateur at the 2013 US Open, the same year he was the US national collegiate player of the year. In Sylvania, Ohio, Thailand’s Thidapa Suwannapura edged two-time major champion Brittany Lincicome in a playoff on Sunday to win her first LPGA title at the Marathon Classic. Thidapa thrust herself into title contention with an eagle-birdie finish at Highland Meadows Golf Club in Sylvania, carding a final-round 65 for a 14-under par total of 270. She could only wait and watch for more than an hour as American Lincicome and overnight leader Brooke Henderson of Canada tussled for the lead, Lincicome closing with a 4-under 67 for 270 as Henderson settled for a 69 that left her in third place on 271. The 25-year-old, who chipped in for eagle at the par-5 17th then birdied the par-5 18th in regulation, put her tee shot at the first playoff hole — the 18th — in the fairway as Lincicome found a fairway bunker. Lincicome then blasted into the water hazard, as Thidapa put her third shot five feet from the pin. Lincicome kept the pressure on as best she could, rolling in a six-foot putt to save par, but Thidapa calmly made her birdie putt for a long-awaited first victory. “I never expected it was going to be today at all,” said Thidapa, a Ladies European Tour winner who had only two prior top-10 finishes on the LPGA Tour. “I’ve been struggling the whole year, trying to keep my tour card, trying my best. And finally all my work I’ve been doing has come out and shown today,” added Thidapa, who joined sisters Ariya and Moriya Jutanugarn as the only Thai players to win on the LPGA Tour. With the win, Thidapa earned one of five places on offer this week at the Women’s British Open, three years after she feared back surgery would end her golf career.